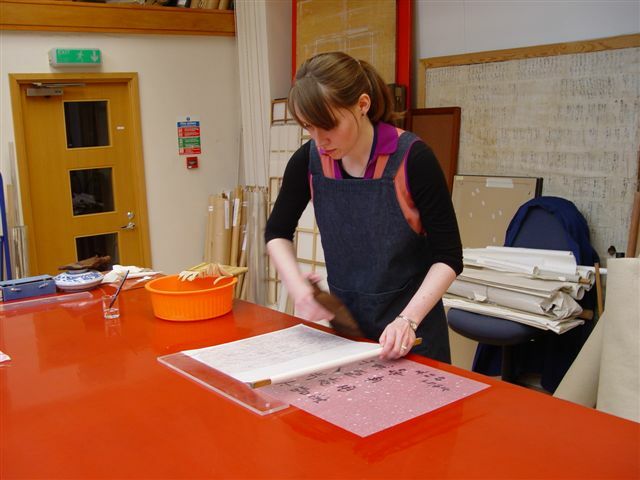 In the autumn of 2011 Carol started the one-year fulltime MA course in Conservation at Camberwell. She was also offered and accepted a permanent position to train as a conservator of Chinese Paintings at the British Museum, following an internship there. She says “both the Museum and Camberwell College were very supportive of what was an incredible training opportunity ... for the past year I have worked part-time at the Museum to enable me to complete the MA course without disruption”. Carol was able to put the training she received at Camberwell to practical use in the British Museum during the year. And “in the second half of the year, I was able to combine my work even more closely... as for my MA Major Project I chose to research the complexities of Chinese scroll mounting as a conservation strategy. This meant that I could actually complete the practical part of my project within the Museum and make use of the Hirayama Studio’s specialist facilities as well as undertake the work under the discerning eye of my Master and Teacher, Qiu Jin Xian – an aspect of the mounting process I was keen to draw attention to in comparison to Western modes of training”. Carol became a Trustee of the Anna Plowden Trust in 2014; she continues to work at the British Museum.